2 Bedroom Terraced House To Rent in Rotherham for £600 per Calendar Month. Available immediately is this fantastic two bedroomed mid terrace with lovely enclosed rear garden. Parking is offered on street to the front of the property - the front area is block paved although the curb isnâ€™t lowered, but this could provide offstreet parking if required. The home is then entered directly into the lounge, which is neutrally decorated with new carpet having just been fitted. The electric coal effect fire creates a focal point and will create a cosy atmosphere. The lounge is open plan with the dining room and kitchen - being fully open downstairs creates a fabulous family friendly and spacious feel. The dining room has laminate flooring and breakfast bar, as well as fitted cupboards which provide space for a double fridge freezer, as well as handy storage under the stairs. The kitchen at the rear overlooks the garden, and has matching Sage coloured wall and base units with complimenting wooden worktops. 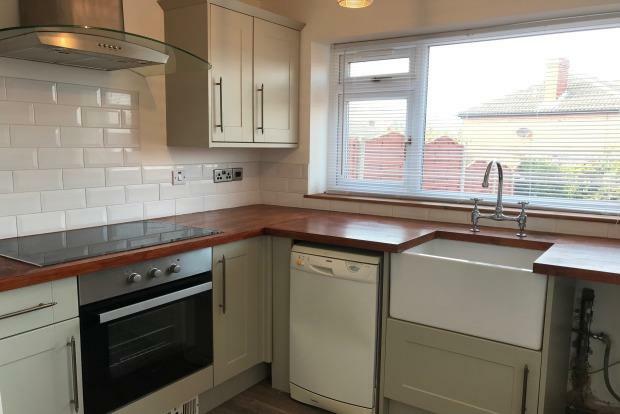 Already in place are the electric cooker, large electric hob and cooker hood, as well as the slimline dishwasher which will be left as a goodwill gesture for the new tenant. The Belfast sink adds a timeless twist and the plinth heater ensures that whoever gets up first doesnâ€™t make the coffee in the cold! There is also space for the new tenants to supply and fit their own washing machine. The stairs lead from the lounge area and head to the first floor. Here is the master bedroom, a great size double facing the front, with a large built-in cupboard housing the gas boiler, which is easily large enough to house wardrobes and drawers to keep the bedroom clear. The second bedroom at the rear has laminate flooring and views across the garden, and is a generous single or potentially a small double. The family bathroom is partially tiled with white suite, comprising of bath with shower over as well as mixer tap, basin with vanity unit, WC and heated towel rail. An additional cupboard on the landing adds valuable extra storage space. Accessed from the kitchen, the rear garden has large block paved patio area, lawned area with a washing line and shed. Additionally there is electric supply to the rear for the lawnmower or a patio heater! This property is ready to view immediately. Located in ever popular Wickersley, this fantastic home has fantastic transport links to the M1, M18 and Sheffield parkway and is well served by bus routes. The local amenities of Wickersley are within a short drive. One pet might be accepted subject to a further deposit charge.